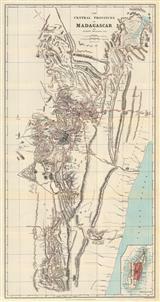 Description: Early miniature map of Madagascar and the coast of Mozambique. Accompanied by an English text description front and verso. Coloured. 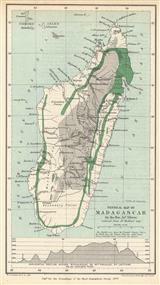 Description: Madagascar and part of the mainland. Decorative cartouche. Coloured. Description: Madagascar. Striking map with large figurative cartouche. Coloured. Description: Madagascar and African coast. Sea chart. Comoros. Description: Elegant map showing part of the African east coast and Madagascar. Insets include Reunion Island . Rich original colour. 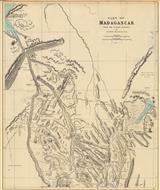 Description: This map of Madagascar is based on a new survey conducted by James Augustus Lloyd while he was Surveyor General of Mauritius. Description: West Central Madagascar. Paper by Joseph Mullens: Original colour. Description: Detailed physical map by James Sibree, an English missionary and naturalist. Printed colour. Description: Imerina, Central Madagascar. Paper by Rev. J. Sibree. Original printed colour. Description: West coast and distribution of tribes. Paper by J.T. Last. Original printed colour.